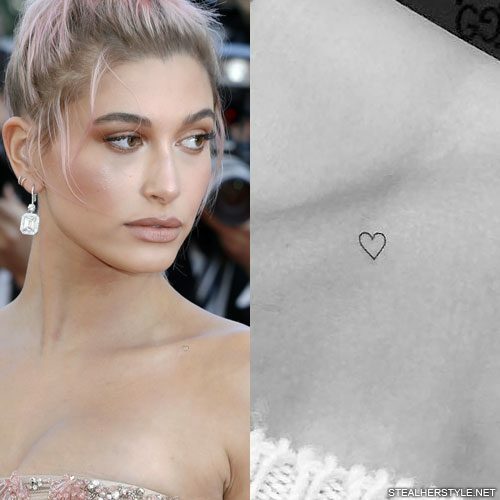 Hailey Baldwin got a tiny heart tattoo on her left collarbone from her favorite artist Jon Boy in April 2018. 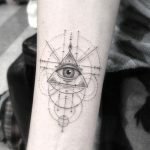 Not only is the tattoo small in size, but its thin lines make it hard to see. 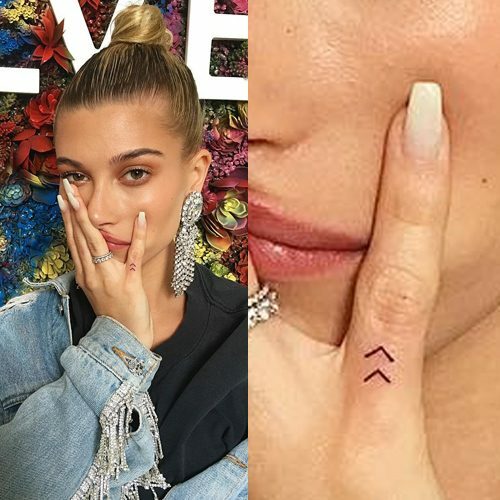 Hailey Baldwin got a tiny tattoo of two chevrons on her pinkie finger from artist Jon Boy at the Revolve Festival in April 2017. 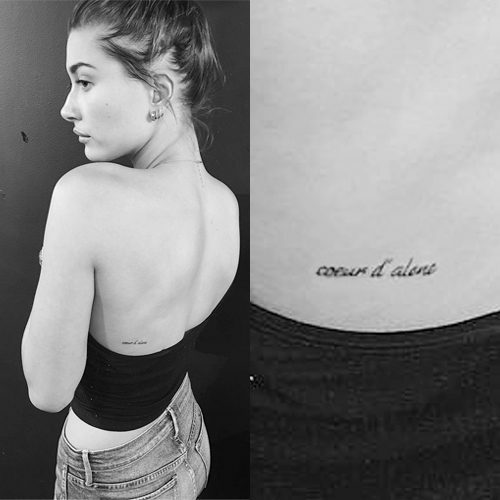 Hailey Baldwin gets a new tattoo, the french words “Coeur d’Alene” inkes on her back. 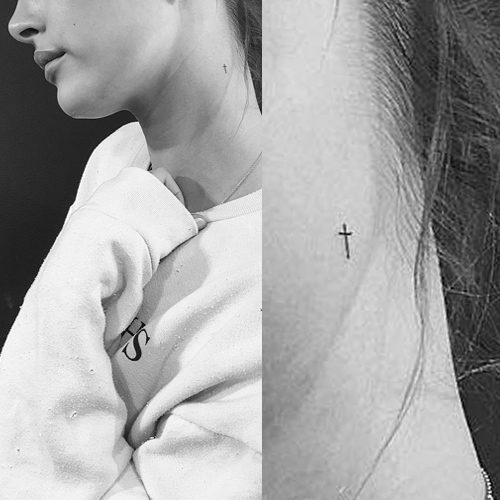 Hailey Baldwin has a tiny cross inked on the left side of her neck. She is a devout Christian and has found her home at the celebrity-favorite Hillsong Church. “They’re very geared toward young people and making it applicable to everyday life, which I think is where people get a little confused in church, because it can be hard to relate to something so old school,” she told Fashion Magazine. Religion is not new to her, as she grew up going to church. Hailey often posts uplifting Christian messages on her social media accounts, and though she knows that not everyone shares her beliefs, “it’s something that I’m not afraid to share with people because I know how it inspires me — how it positively affects my life,” she told Teen Vogue. 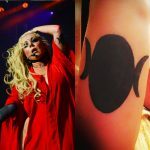 In real life she likes to surround herself with fellow believers since her faith is so important to her, and that can be hard for non-believers to understand. 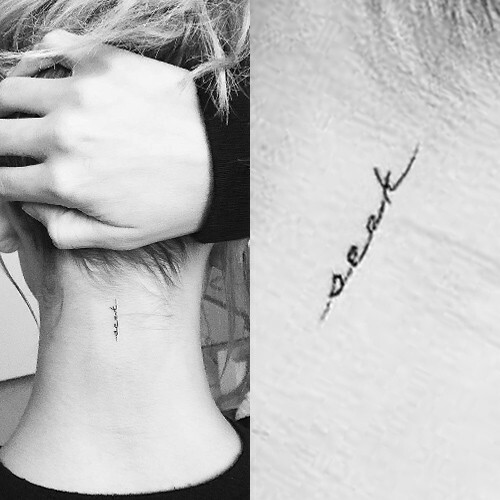 Model Hailey Baldwin has a new tattoo on her spine and it’s the smallest we’ve ever seen. 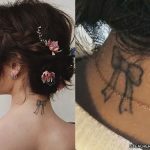 Celebrity tattoo artist Jon Boy has shared an image On Instagram on October 21, 2016 of the fresh ink on Hailey’s back which reads ‘unseen’. 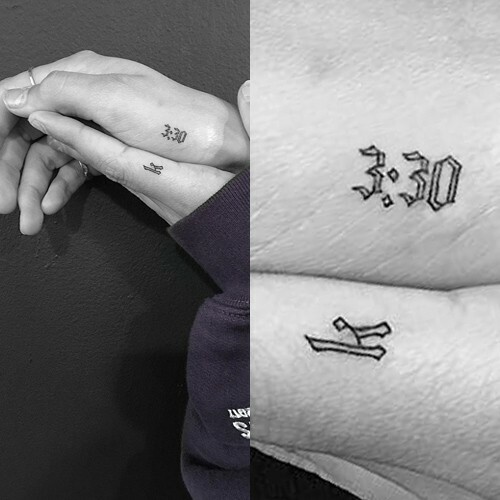 While there has been no explanations about the meaning of the mysterious tiny tattoo yet, Jon Boy did tag the bible reference 2 Corinthians 4:18, which reads: “So we fix our eyes not on what is seen, but on what is unseen, since what is seen is temporary, but what is unseen is eternal.” He also tagged Hillsong’s New York branch which Hailey has reportedly attended. 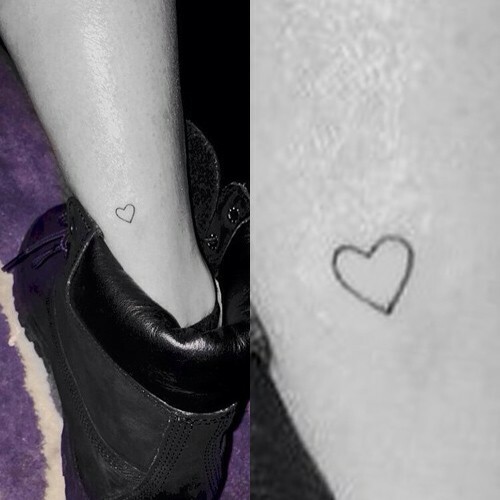 A tiny heart outline on inked on the back of the ankle in black was Hailey Baldwin’s second tattoo. Hailey Baldwin hit up celebrity tattoo artist, Jon Boy, in NYC with BFF Kendall Jenner on Tuesday June 22, 2016 to get a tattoo. 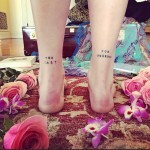 Her new ink has the letters “P” and “R” on her left index finger, and the letters “A” and “Y” on her right index finger. 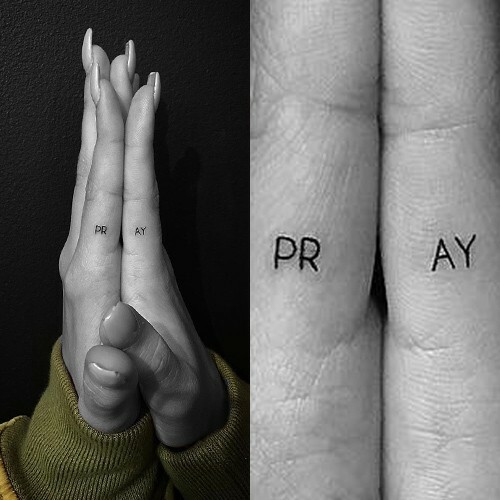 In the picture posted by Jon Boy, Baldwin’s palms were facing together in a praying position, bringing both index fingers together to spell the word “PRAY.” He captioned the photo “P R A Y on @haileybaldwin created by @kendalljenner tattooed by #jonboytattoo ?”, so it was Hailey’s BFF who actually came up with the idea of this tattoo. 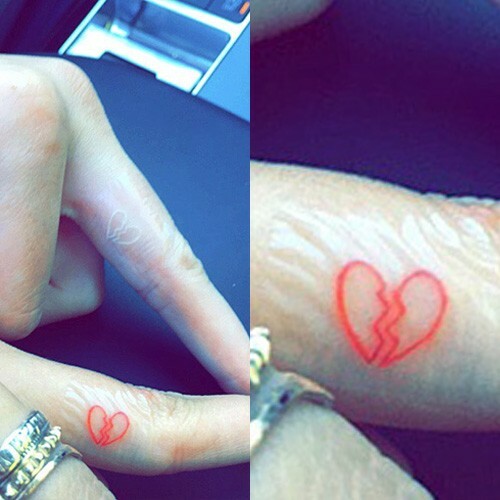 Hailey Baldwin has a tattoo featuring a small heart that is broken in half, inked in red on the inside of her left-hand middle finger. Hailey Baldwin hit up Jon Boy in NYC for another tattoo. 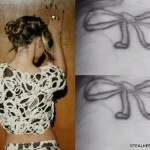 This time she had the word “seek” tattooed on the back of her neck in cursive script and black ink.